Remote Year Yugen has taken the idea of "positive impact" to the next level in their pursuit of building 58 houses in Bogotá in partnership with TECHO. Elizabeth Blasi of Remote Year Yugen details how they've done it. Being able to call the globe home is a luxury - and one that should not be taken for granted. 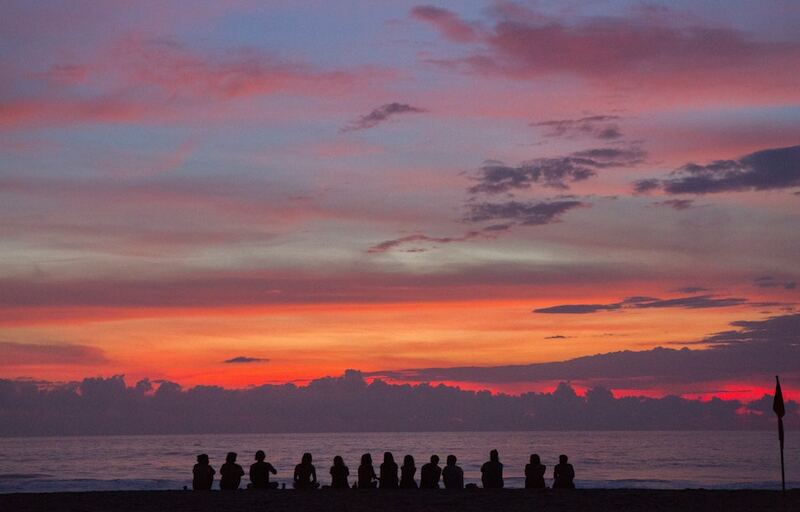 Remote Year is a special experience in that it brings together communities of individuals who each bring their own inspiring knowledge and background to the greater group. From marketers to engineers, and everything in between, each person’s unique skill set develop the community. More than being adventurers on a quest with a hunger to see the world, most location independent workers also feel like they have a responsibility to make a positive footprint on the places they touch, and in the cities they’re lucky enough to call home - even if only for a month. Remotes are given the unique opportunity to experience vast amounts of cultures, meet amazing people with different customs, and learn from the world around them. Every month, Remote Year communities set out to create positive and lasting impact all over the world, whether through the planting of community gardens, or generating eco-friendly water heaters in underdeveloped neighborhoods. Within each program, there’s always the desire to do more and give back. That’s why Yugen Build was created. Yugen Build was created by the Yugen community as a way to give back and say thank you to the city of Bogotá, Colombia. 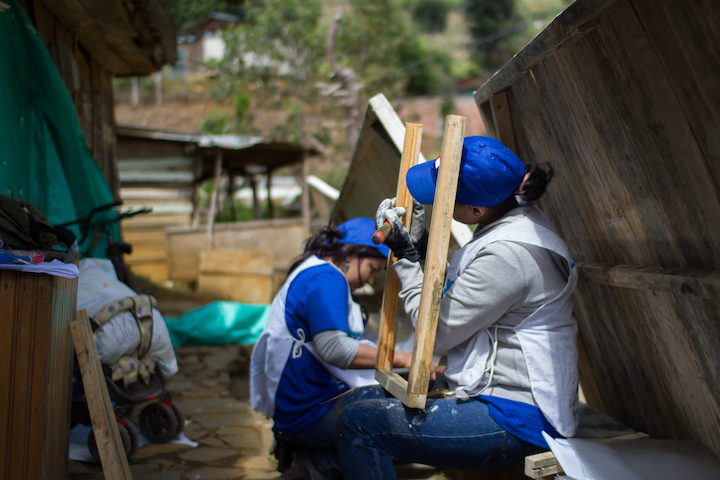 Yugen called Bogotá home for their eleventh month of their program and in a massive group effort to leave a lasting positive impact, Yugen is committed to building 58 homes in partnership with TECHO. The homes will be built within the city’s informal communities and the project will cost a total of $116,000, all of which are 100% donated funds. The number 58 represents each and every member of the Yugen program that stepped foot in Croatia during month one, ready to start their journey with their new family for the year. The most impressive and noteworthy fundraising efforts have come from the within the Yugen community itself. They’ve sent out emails to friends and family to discuss the cause and how a donation could impact someone’s life. They’ve used their own community bonds to fundraise by trading their particular hobbies, passions, or skill sets. 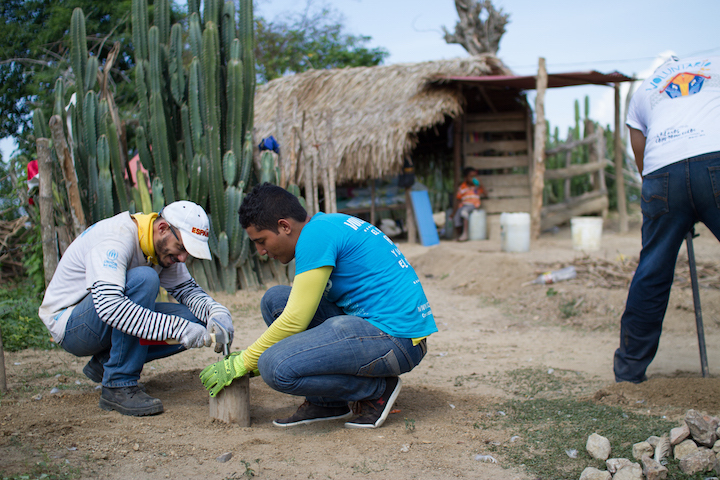 From cooking homemade meals, to providing suitcase packing services in between every destination on their itinerary, Yugen tapped their own community to exchange their valuable time for money towards building new houses for people in Bogotá. 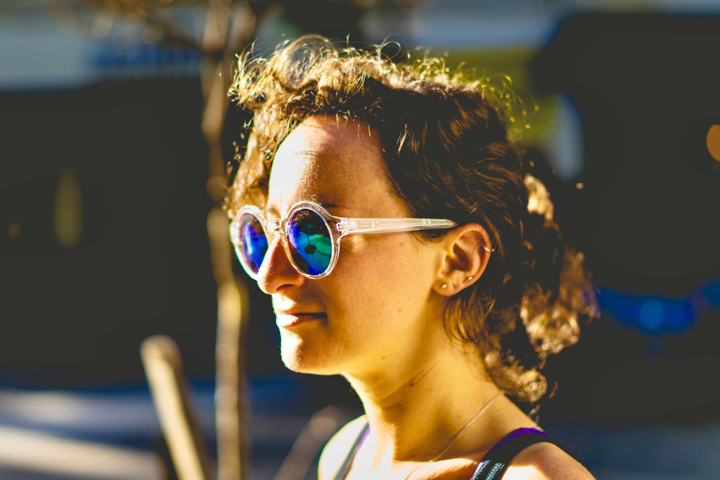 One great example: Lindsay Tigar reached out to her mother to give astrological chart readings to members of Yugen, and in return the costs associated with the readings go straight to the Yugen Build efforts. Yugen was better able to make a fighting difference to those living in informal communities in Bogotá, Colombia by working with TECHO. Not only does 90 cents of every dollar go directly to building homes for families, but TECHO supplies inclusion programs to each of their new residents. Partnering with TECHO allowed Yugen to utilize their online platforms for raising funds, as well as give corporate sponsors ease and comfort knowing that TECHO is a reputable non-profit that’s respected worldwide for its incredible philanthropic efforts. Reaching out to the larger Remote Year community (Remote Nation) of over 1,000 people has been inspiring, motivating, and an integral step in moving the needle on Yugen Build’s fundraising goal. To add a little friendly competition into the mix (as most Remote Year groups have serious pride for their program), Yugen Build created a challenge to see which of the 14 participating groups could raise the most money for the cause. The winners of the challenge will send Remotes to participate in the build, while the second place program will have one of the 58 houses built in their name, along with bragging rights (which in Remote Year world goes a long way). At press time, more than $18,000 has been donated to Yugen Build from other Remote Year programs alone. These funds are enough to provide nine homes to families in need. Three families who now have access to a working and functional home, along with new trade skills courtesy of TECHO resources to help the adults go on to raise their own capital and help their children get an education. Several individuals in the Yugen community are dedicated to updating the participating programs of their current status with weekly updates and associating online trackers to help move the challenge along. Part of what makes Remote Year are the connections Remotes make with locals in the cities that they’re lucky enough to call home. In cooperation with Remote Year’s City Teams, Yugen made connections within many local communities to source help for Yugen Build throughout countries in South America. In Lima, Yugen Build founder and fellow Irishman Paul Nolan, made friends with the local pub owners of Molly’s Irish Pub. On a Friday night, Molly’s offered ten percent of total sales to Yugen Build. By bringing not only Yugens together at the fundraiser but reaching out to locals and expats, Yugens were able to raise hundreds of dollars toward their cause. "It’s amazing to be a part of Yugen Build. I'm inspired because it’s allowed me to see how a small group of individuals from different professions, countries, and organizations can come together to create positive change alongside local organizations and families. 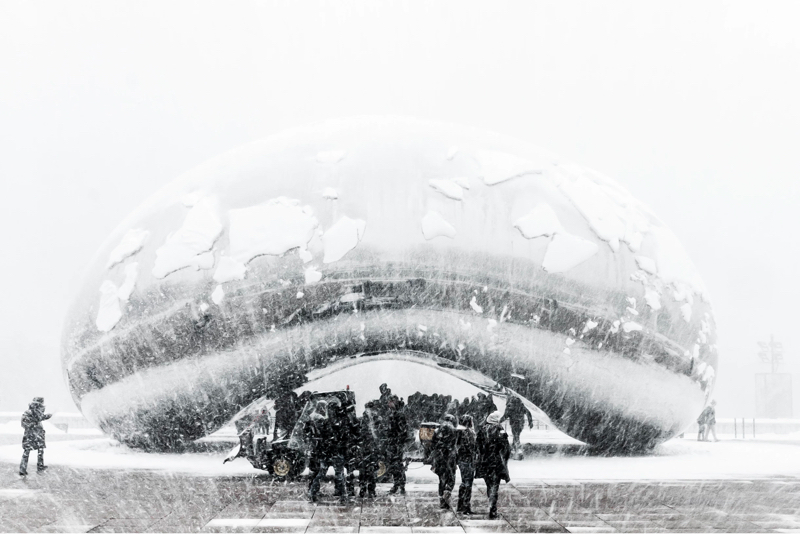 This is one example of global citizenship and I hope more remote workers who travel will make positive impacts in the places they go by bringing the grassroots movements to a global network for greater impact," said Yugen Build support chair Matthew Williams. The philanthropic and generous hearts of amazing corporations have helped Yugen Build towards their goal, with honorable mentions going to Concannon Lumber, who funded the building of two homes, Boehringer Ingelheim who donated five homes, Maverick Investor Group who funded over 2 homes and WNC Health Insurance, Inc who donated one home. Just like the efforts to build lasting relationships and connections within the Yugen community, with locals in each city, and with people throughout the Remote Year program, members of Yugen Build are developing relationships with global corporations. By attending fundraising workshops, participants are enriching themselves in the corporate world, creating lasting relationships with business owners, and have access to tools to help them reach out to Fortune 500 companies for fundraising assistance. Yugen Remotes have a great deal of skills across many concentrations and professions. It was a global construction project manager who initiated the project, followed by a Yugen who works in education in South America who helped put the vision in motion. When a marketing guru hopped on board and set out on developing a face to the project, working with designers, engineers, and developers, well, the rest is history. “It's been amazing to find out how many selfless and talented people we have in our group. We basically formed a mini-agency within Yugen to create an entire brand for Yugen Build including a logo, brand guidelines, talking points, a website, promo videos, corporate sponsorship presentation, social media assets, and more. The team really made everything come to life, and it gave us something tangible to rally behind,” says marketing chair Melanie Long. Yugen didn’t stop within their own community and professional network, they reached out to those they love and admire most. From family and friends countries and oceans away, the passion Yugen members had for making a difference spread like wildfire. Local churches helped build baskets, and siblings and friends of Yugen members held office dress down days and raffles. Some created March Madness brackets upping the entry fees to help out the cause. There was a great deal of support from everyone. Even lads in the Emerald Isle contributed to the cause by hosting a fundraising event at a local coffee shop. “My friends at home in Ireland were aware of the project and decided to help fundraise. One of my friend’s family members owns a coffee shop and decided to have a fundraising morning, which my mother helped organize. Another one of my close friends, who happens to be part of the local Gaelic football team, assisted in creating a crowd at the event and even convinced the team to make an appearance with their recent provincial trophy. It was a fantastic effort made by my people in Ireland, to help provide homes to those living across oceans in Colombia. The project is truly a global one!” says Paul Nolan. 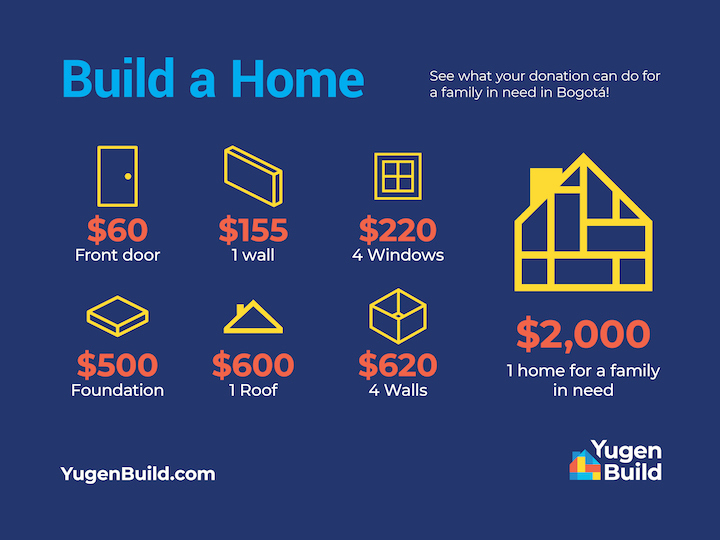 If you are interested in donating, or learning more about how to bring homes to those living in informal communities in Bogotá, Colombia, go to YugenBuild.com.